In this week’s Junkyard Tales story "Traditions", Ben Thompson, clever cat, wakes to the sound of tiny mice hunting for glass stars. Hiding colorful glass stars for the mice to find is one of many fun Junkyard holiday traditions. While the image of a tiny mouse delighting in a pretty bauble is magical, the sight of small human hands clinging to these cookie “glass stars” is perhaps even more so. They’re made with regular sugar cookie dough—there’s a recipe below, but feel free to substitute your own, or even store bought. To make the “glass” you crush hard candies, like Lifesavers, and spoon them into the middle about halfway through baking. The only thing to remember is to keep your center cut-outs in simple shapes, as it’s hard to get the candy to flow into more complicated designs. These are delicious to eat, but would also be lovely hung in a window to catch the winter light! In a large bowl, sift together the baking powder, baking soda, salt, and flour. In another bowl, cream together the butter and sugar. Mix in the egg, milk, and extracts. Then, slowly mix the dry ingredients into the wet. Chill the dough in the fridge for at least an hour before continuing. In the meantime, crush the hard candy. Using a separate bag for each color (or not, if you want multi-color stars! ), put the candy in a plastic bag and gently bang on it with a rolling pin or large can. Set aside. When the dough is chilled, pre-heat your oven to 300 degrees. Roll the dough out on a floured countertop. Then, begin cutting out your shapes. 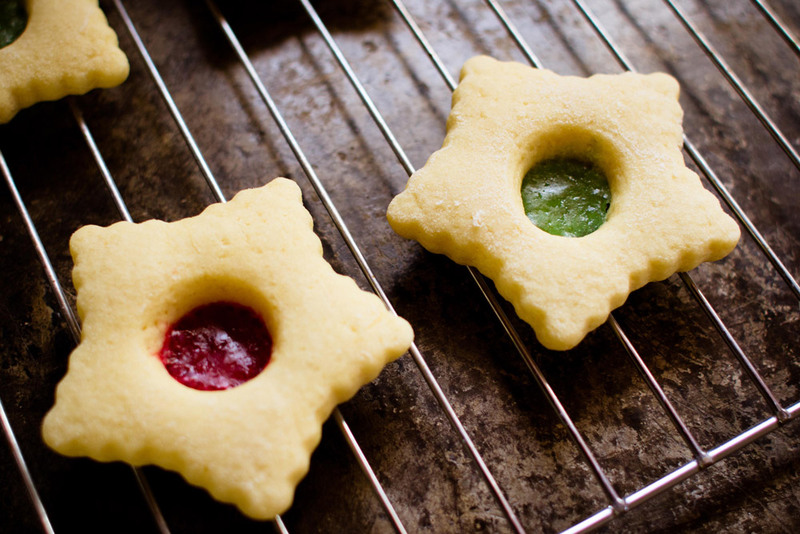 Cut out the big, outer shape first, then use a smaller cookie cutter to make the “window” in the center. Place the cookies on a bake sheet, and into the oven for about 6 minutes. Then, working quickly, pull the cookies out of the oven, and spoon the crushed candy into the center of each one. Return the cookies to the oven and bake for about another 6 minutes, or until you can see just the tiniest hint of brown on the edges. Let the cookies cool a few minutes before moving them so that the candy centers have a chance to set. Then, enjoy them for both dessert and decoration! Benjamin Thompson is an unusual name for a cat. But then Ben is an unusual cat. Whether by fate or by folly, he finds a home in an unusual place – a Junkyard. And there he finds his place in a community of delightfully unusual friends: a steadfast watchdog, a refined rat, a silly skunk, a wise old possum, and a host of helpful mice. Junkyard Tales delights in the joys, challenges, and adventures of friendship, community, and doing good in the world.